While bulgur is often cooked on the stovetop, this version lets the grain slowly rehydrate in the refrigerator, saving the mess of cleaning a pot. Add strips of grilled chicken to make this a higher protein dish. Combine first 10 ingredients (bulgur through black pepper) in a large bowl. Cover and refrigerate for at least 4 hours or overnight. 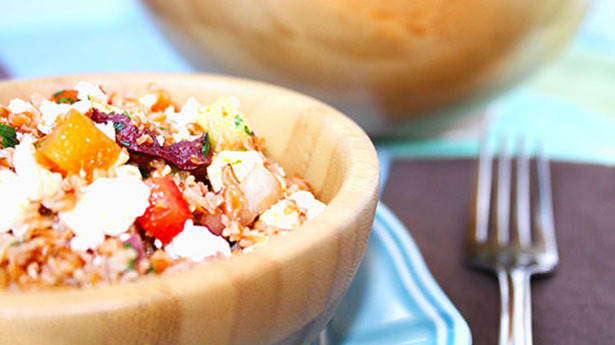 Uncover bulgur mixture just before serving and stir in cucumber, feta cheese, olives and parsley. Serve on plates or in bowls with a lemon wedge for squeezing.